An early morning pick up at 07:00 AM from your hotel in Luxor then transfer to Aswan for a amazing trip to visit the charming Philae Temple established on the honor of the chief deity of the island "Goddess Isis", get your lunch meal in Aswan local restaurant then experience Felucca ride to the Nubian Village located at the bottom of Elephantine Island to witness the simple life style of the nice and friendly Nubian people. 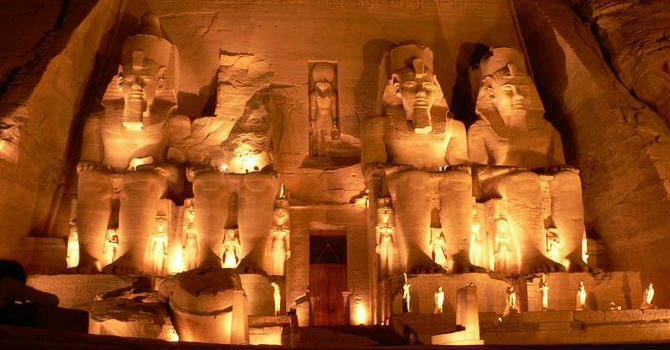 Transfer to your hotel in Aswan and overnight. Another early morning departure by 03:30 AM with breakfast box prepared by the hotel then join your guide and driver to explore the 2 Temples of Abu Simbel to wander their unique style. It is considered as the masterpieces of ancient Egypt reflecting the magnificence of the new Kingdom art work. The Grand temple of Ramsses II was devoted to the 4 universal gods Ptah, Re Her Akhtey, Amun Re & Ramsses II himself. This great temple is called The Sun Temple and the small one of his wife Queen Nefertari is Called the temple of God Hathor so in a symbolic way they bring Ramesses II, Nefertari, Hathor & Sun God all together as one. Get your lunch meal in local restaurant before you transfer back to your hotel in Luxor.